Why don't you get blood clots when you sleep but get it when you sit for long hours? Why Can Sitting For A Long Time Cause Blood Clots, But Sleeping For Hours Doesn’t? 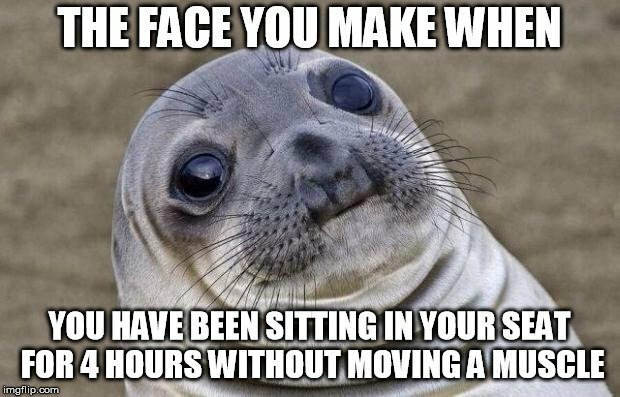 You may have observed that when you sit in the same spot, in pretty much the same position, for even an hour, your legs start to feel… weird. It’s a strange sensation indeed; some feel ticklish, some feel pain or discomfort, some feel an uncontrollable urge to move their feet, and some partially lose sensation in their legs. Some or all of these symptoms begin showing when you sit in the same position for even as little as an hour or two. On the other hand, when we sleep, we typically lay down and remain still (for the most part) for 6-7 hours on the bed. Yet, that doesn’t seem to hurt us or result in the kind of symptoms mentioned above. Sitting for a few hours can cause discomfort or even result in the formation of blood clots (which could potentially be deadly) in the body, but sleeping doesn’t seem to have the same effect on the body. Why is that? As you know, the heart is the most important part of the human circulatory system. Blood begins its journey from the heart; after exiting the heart, blood enters the aorta and arterial system. Arteries are much thicker than veins, as they consist of thick layers of muscle and elastic fibers. Arteries being thick is actually very important, as they have to stand the pressure of blood flowing through them. Also, their elasticity comes in handy to push the blood and make it flow smoothly. 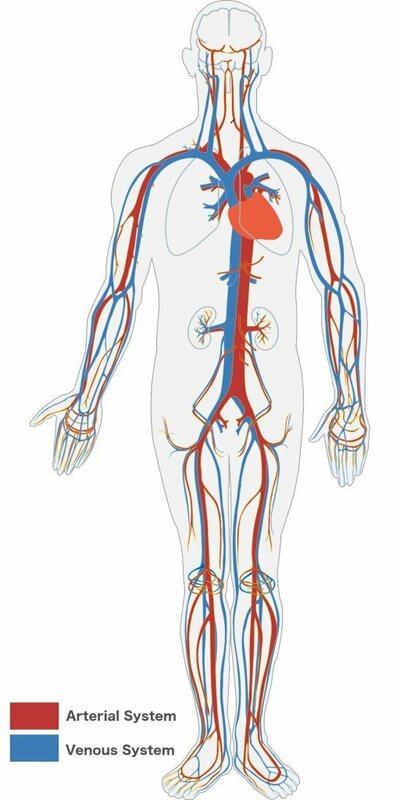 After going through capillaries (the most basic and thinnest kind of blood vessels), the blood enters the venous system and heads back to the lungs and the heart. The venous system contains very floppy vessels with valves that help to prevent the backflow of blood. It has a significantly thinner tunica media (the middle layer of the vein), and as such, it relies on the contraction of the skeletal muscles (muscles that you voluntarily use while walking) for proper blood flow when blood must flow against the pull of gravity (i.e., from the legs up to the heart). 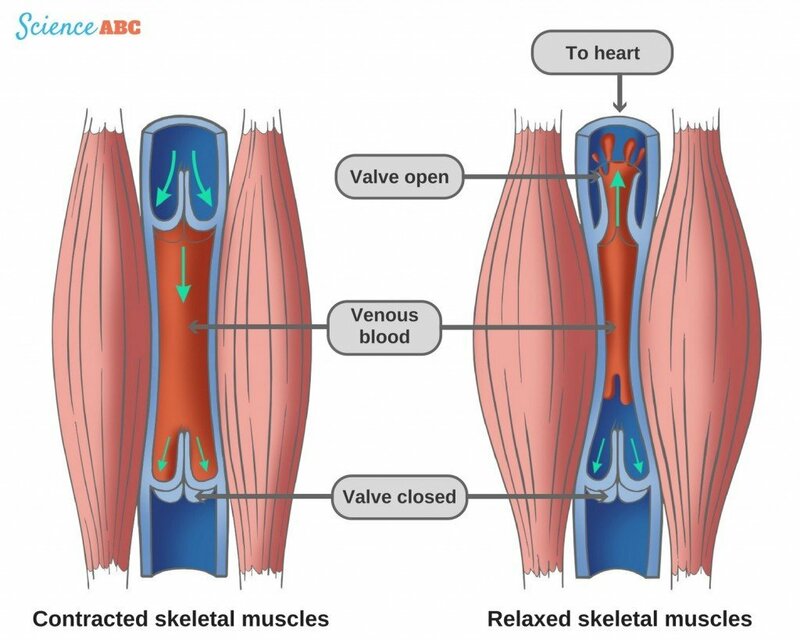 Notice how the contraction/relaxation of skeletal muscles impacts blood flow in the veins. Since blood in the veins has to work against gravity to move upwards (towards the heart and lungs), when one remains in a sitting position for too long, the blood may not move fast enough. This could trigger the clotting mechanisms in the body, which could potentially form a blood clot (or in biological terms, a thrombus). When you are in the ‘lying down’ position, or the kind of position one has while sleeping, your legs are more or less on the same horizontal plane as your heart. Due to this, the blood doesn’t have to work as hard to fight the gravitational pull to reach the lungs and heart. Hence, the ‘return flow’ of the blood becomes relatively easier. You do move ever so slightly while sleeping, but that doesn’t cause any blood circulatory problems because your body is mostly straight (flat) and the blood doesn’t have to flow upwards. However, that doesn’t mean that one is absolutely safe in the ‘lying down’ position indefinitely. Even while lying down, gravity is still the most influential variable to the blood flow. It’s just that while lying down, the gravity variable is partially alleviated, making it less of a problem for 8-15 hours. That being said, if you stay in the same lying down position without any movement for more than 20 hours or so, you may begin to face problems. That’s why doctors take this issue into consideration while treating bedridden patients so that clots don’t develop in their blood. The dynamics change. 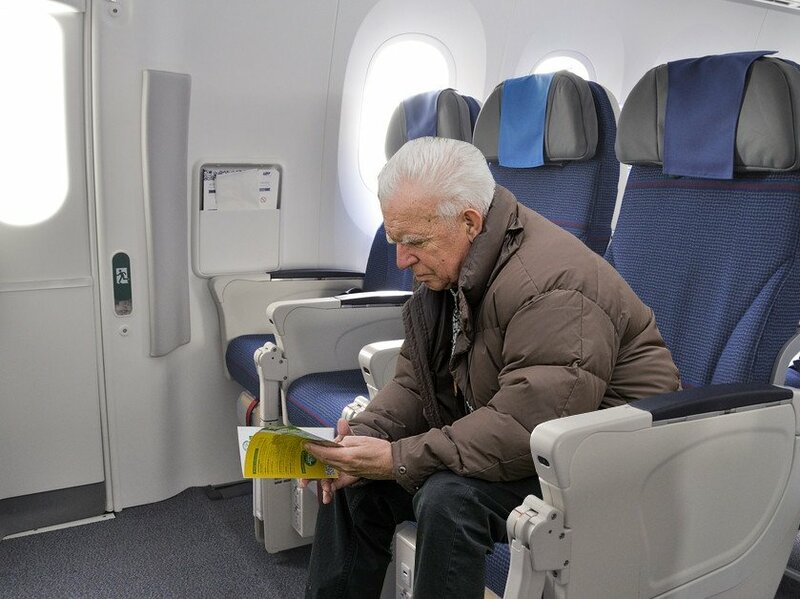 While being in the ‘sitting’ position for an extended period (this usually happens when one is traveling in trains, buses or airplanes), skeletal muscle activity is low. In this position, the legs also aren’t moved very much and they are often angled. As such, the blood flow fights against gravity. Due to certain biological processes that occur, the velocity of blood flow in the upwards direction (against gravity) is reduced. This can potentially lead to the formation of blood clots in the body. The thing about such a blood clot is that it can float through the veins and reach the lungs, where it could severely damage a part of the lung (a condition called Pulmonary Embolism) before it’s treated. That’s why it’s always recommended to get up frequently and move around a bit while traveling on particularly long flights or bus/train journeys.